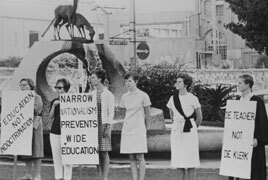 In 1955 a small group of white middle-class women who were predominantly English-speaking formed an organization called The Women's Defence of the Constitution League. Founder members were Jean Sinclair, Ruth Foley, Elizabeth McLaren, Tertia Pybus, Jean Bosazza and Helen Newton-Thompson (among others). The organisation grew into an avenue for liberal women to oppose government policies by means of marches, convoys, demonstrations and vigils. It came to be called the Black Sash because the women wore black sashes over one shoulder as they stood to demonstrate against discriminatory legislation. It was initially formed to protest against the Separate Representation of Voters Bill, a ploy by the government to remove Coloureds from the common voters' roll. The women saw this as a flagrant attack on the spirit of the constitution. To show their disapproval and bring this injustice into the public eye they stood silently on pavements outside public buildings in the major cities, wearing their black sashes. They attracted some support but also criticism from the white public. Supporters of the Congress Alliance were heartened by this stand, but efforts to form links between the Black Sash and the FSAW failed to materialize. Once the legislation on the Coloured vote had been passed the Black Sash continued to demonstrate against legislation that infringed the rule of law. The Black Sash was formed in 1955 and it began as a tea party of six women, Jean Sinclair, Ruth Foley, Elizabeth McLaren, Tertia Pybus, Jean Bosazza and Helen Newton-Thompson. The women were opposed to the Senate Bill which asked for a two thirds majority of both houses of parliament to remove coloureds from the common voters role. The organisation grew into an avenue for liberal women to oppose government policies by means of marches, convoys, demonstrations and vigils. This was the founding of the Women’s Defence of the Consitution, the symbol of the organisation, a constitution draped in a black sash, showed their mourning of the constitution. The media soon nicknamed the organisation the “Black Sash” referring to the sash and also the black sashes that members draped over their right shoulder during protest demonstrations. Di Bishop of Port Elizabeth who joined the Black Sash in 1978 played a significant role in the activities of the Black Sash. Bishop was elected into the Cape Provincial council in 1981, a position that she used as a platform to challenge issues regarding apartheid. Together with Molly Blackburn she spent a lot of time recruiting for the resistance movement. The Black Sash also was concerned with monitoring of pass law courts as means of exposing the injustices that were involve in enforcing Pass Laws to Africans. In doing this the women set up advice Offices which operated in various parts of the country, other problems handled by these offices included employer/employee problems, work compensation, unemployment insurance and pensions. The Sash, as it was sometimes known, worked with a number of organisations, including the United Democratic Front (UDF), The Federation of South African Women (FEDSAW) and the End Conscription Campaign. After the 1994 elections, the Black Sash shifted focus from being a protest organisation to become a professional one, still upholding the same principles of making submissions to government in shaping legislation and advising on welfare.